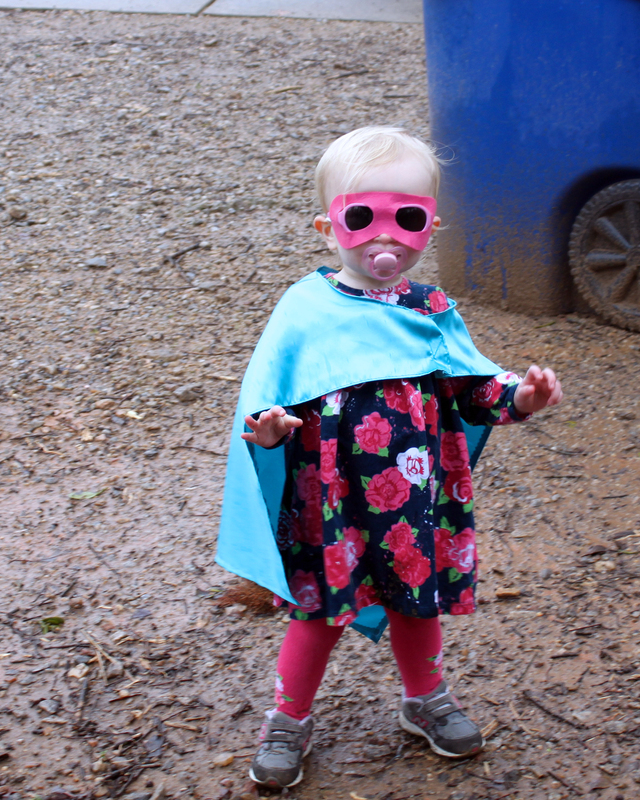 The other day, while eating breakfast, C looked up at me and said, “Mom, you are a superhero.” Of course my heart melted, but I also wanted to hear more. C has an amazing mind and sometime asking a few probing questions will render delightful answers. Me: That’s kind of you. Which Superhero am I? Me: Oh, really? What does Wonder Woman do? Me: You’re right. I am Wonder Woman! 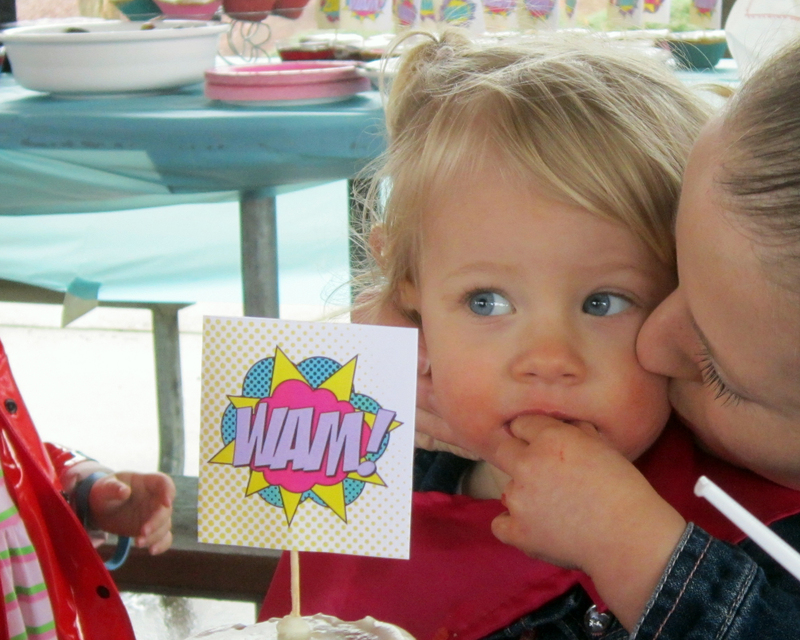 We don’t often talk about superheroes in my house, with my two little belles. We spend hours talking about the lives of all the Disney princesses, the princesses in their books and of women in the Bible. Last Spring, however, A (almost 2) started putting her washcloth on her back and shouting that she was coming to the rescue! 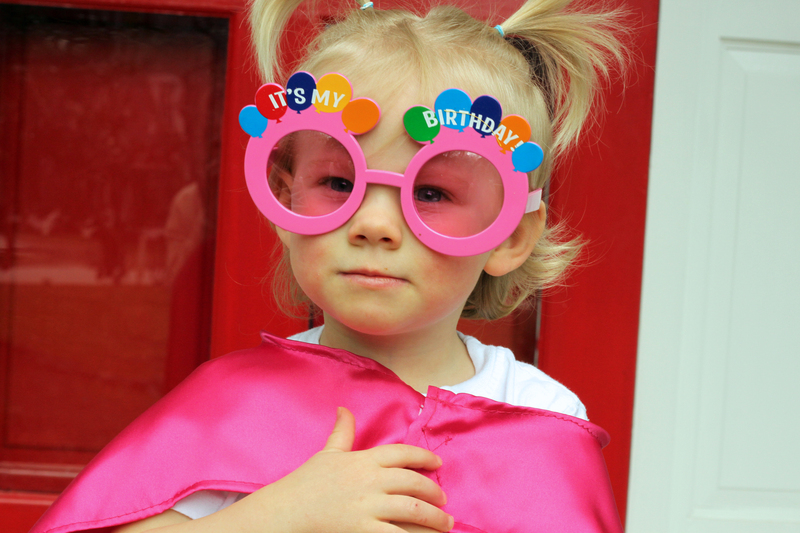 It was so stinkin’ cute, I couldn’t resist throwing her a ‘Super’ birthday party. 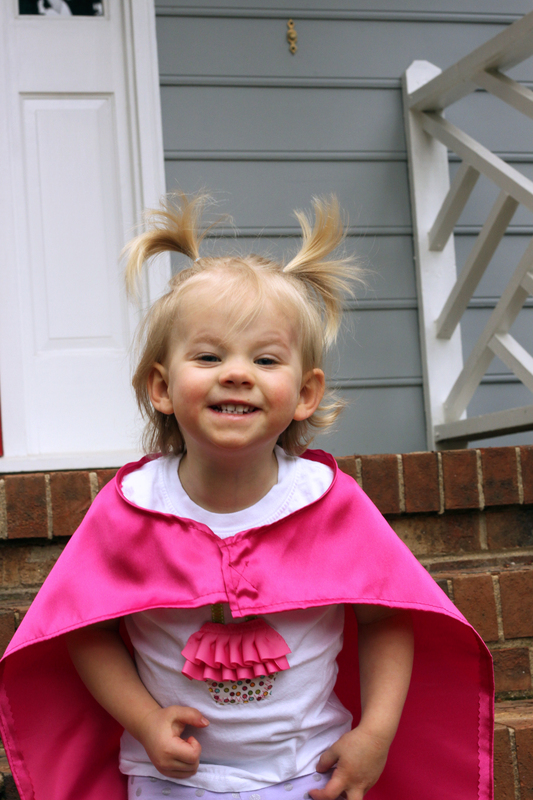 I started by placing an order for superhero capes and masks from Capes and More on Etsy and am delighted when I still see little heroes zipping around our neighborhood six months later – imagine a party favor that gets used! I also contacted Lowes and had them save a refrigerator box for me. After all, we needed a phone booth in which to change. 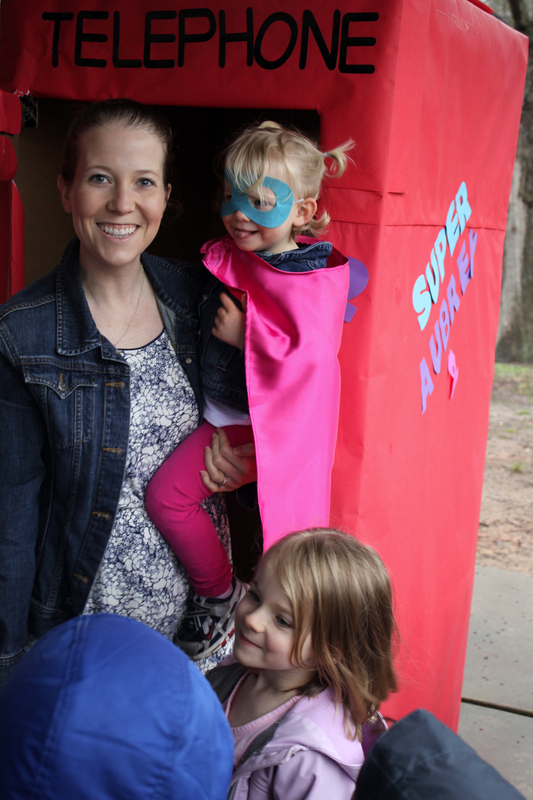 At the party, I had each of the kids take a superhero test to ensure they would be able to serve and protest. First, they each had to leap over a tall building, which I’d created by covering a cereal box in dark paper and pasting on yellow rectangles to resemble windows. In retrospect, I wish I’d put a can of something in my building so that it would have stood up better without being held. Next, each of the heroes was tested for their speed. With the foam cone I’d covered in silver paper and put it on the end of dowel, I chased the kids around with my “speeding bullet”. 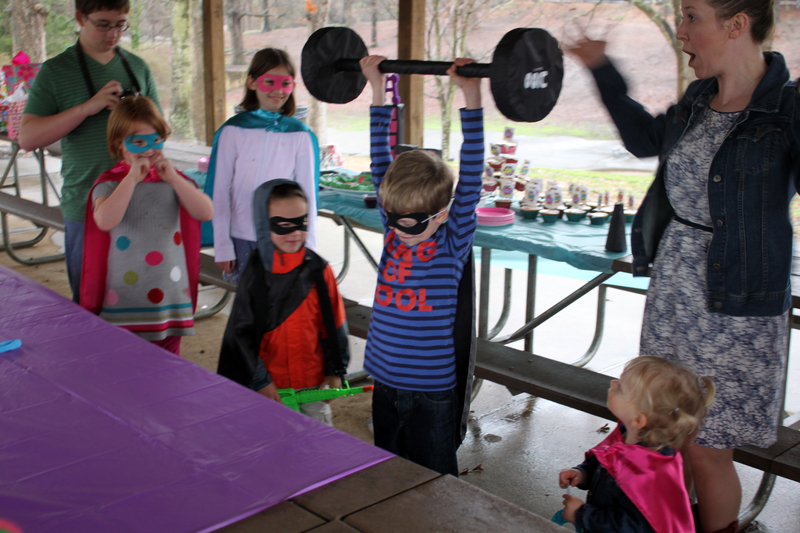 And lastly, we tested their superhuman strength by having them lift a “2,000” barbell, which I’d made from foam and the cardboard roll from wrapping paper. 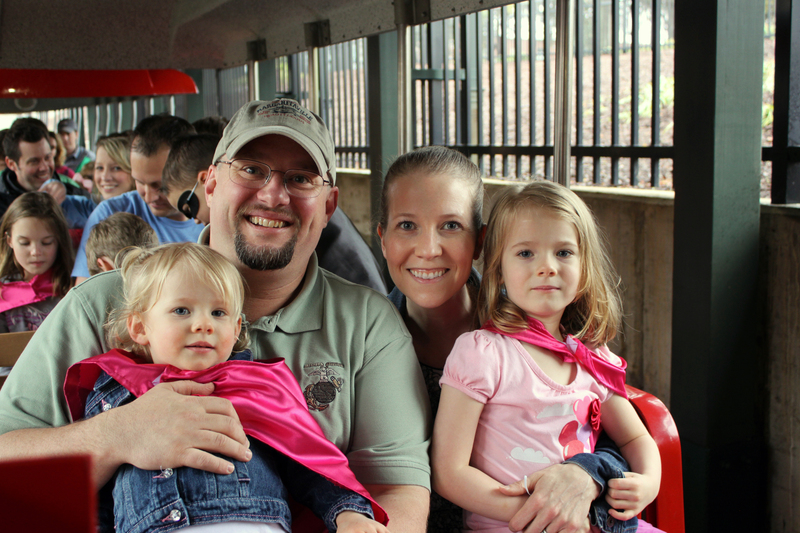 We had the party at Pullen Park in Raleigh, so we of course also indulged in a train ride, followed by a ride on the carousel. Food was a bit challenging. We were only a couple months into our new gluten, soy and nightshade [potato, tomato, pepper & eggplant] diet and I was a bit at a loss when it came to party food ideas. I ended up serving cold cuts, cheese I’d cut into the shape of lightning bolts, Jello, cupcakes, fruit wands and rice krispie treats. -For the lightning bolt cheese slices, I ordered a cookie cutter from Amazon. If I could do it differently, I would have gotten a much smaller one as we were barely able to get one lightning bolt from a slice of cheese. -I’d meant to cut the Jello into lightning bolts as well, but realized that I was very short on refrigerator space and would never have been able to get this project done and get a couple hours sleep before the party. I was actually rather proud of myself for settling to make Jello parfaits in clear cups rather than the gigglers I’d originally planned. I had two purchased purple, pink and blue and ended up layering them in the cups, but the colors were too similar and the layering it wasn’t actually noticeable. -The cupcakes are something of a mystery. I’d been working on the with the help my my 4 year old and my niece, when I had to pause to put my girls to bed. I’d left the batter on top of the hot oven and while I was away, the consistency became rather interesting. Once out of the oven, the cupcakes were neither pretty nor yummy. All of them had a concave top, rather than the nice convex tops I’d been hoping for. I decided that filling the cupcakes was going to solve two problems, so I started frantically pulling “stuff” out of my fridge and mixing it on the stove. For breakfast, we’d had crepes and there was still quite a bit of raspberry sauce I’d make from frozen raspberries and honey. I added some lemon zest, then lemon juice, then sugar and I forget what came after that. At some point I just started filling the cupcakes feeling a bit demoralized by my kitchen fiasco. The next day, we added frosting and somehow these little cakes became the rave of the party. My mother-in-law was a little dismayed when I couldn’t share the recipe with her, having no idea what we’d done in the end. I topped the cupcakes with adorable cupcake toppers from Fine & Dandy Printables, also on Etsy. -The fruit wands turned out rather well. We’d cut watermelon into stars using cookie cutters. We layered grapes, melon and berries onto skewers then topped them with the watermelon stars. They ended up being A’s favorite of all the food we’d prepared. -I especially liked the rice krispie treats. I’d used gluten-free rice krispies and had followed the directions on the box, adding green food coloring after the marshmallows melted. 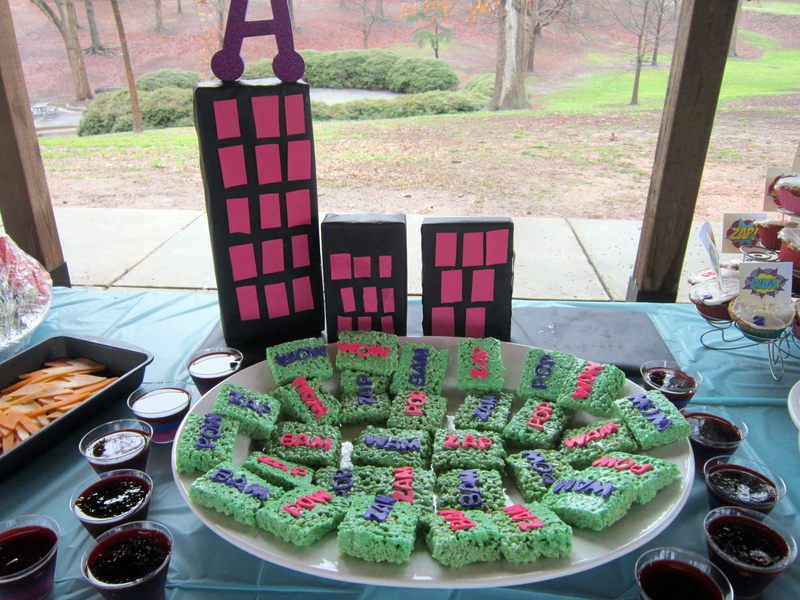 I’d purchased colored fondant and letter shaped cookie cutters, We cut out three and four letter “super” words like “Zap!”, “Pow” and “Wham!” and had used a tiny bit of frosting applied with a toothpick to stick the words onto the treats. True to form, the night before the party I was working on ALL the preparations. We had six house guests, three of whom were adults and were kept working late into the night along with Mr. M and an amazing neighbor, who may actually be my twin separated at birth, who was sweet enough not to know what she was getting herself into. Around midnight as my neighbor and I struggled to construct the phone booth, I had an idea to solve a problem we’d been having with the door. In response to her “that was a smart idea” comment, I exclaimed, “If there’s one thing about me you’ll learn it’s that if there is an easy way to do something, that is always the route I will take.” She glanced incredulously around the room at my sister-in-law cutting tiny letters for the rice krispie treats, my brother-in-law cutting watermelon stars, my mother-in-law creating lightning bolts from cheese and my husband hauling the five tubs of decorations to the truck. Quite matter-of-factly, she told me, “Let’s be clear. There is nothing easy about what’s happening her tonight.” The next day, I was of course a bit blearily eyed after getting only 3 hours of sleep. 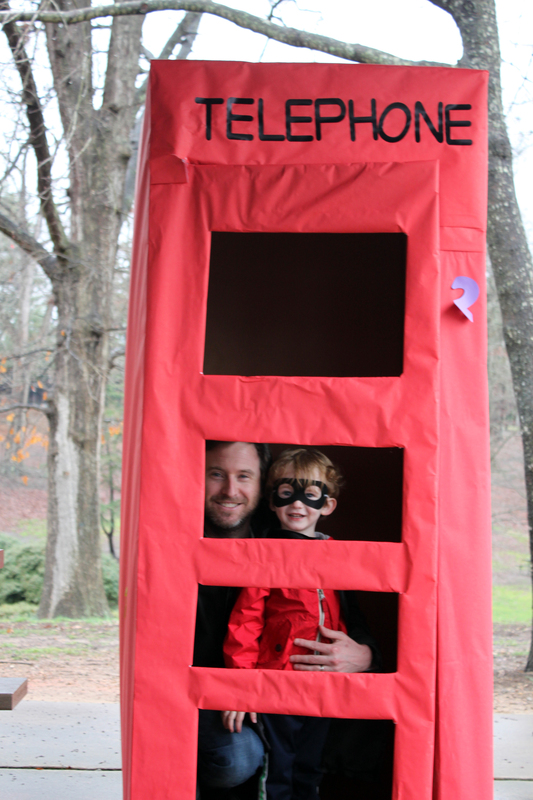 It was raining lightly, so most of the decorations went straight into the trash after the party, including the phone booth that had been hours in the making. The darling picture of all the kids in their capes that I’d hoped would turn out wonderfully didn’t happen because I was too tired to remember to take it. I was grumpy with Mr. M and worse yet, I didn’t end up spending the time I wanted to with my in-laws who were only in for two days. When we live our lives without margin: margin in our time and margin in our finances, we miss out on a lot that God wants us to experience in life. He asks us to follow His example and guess what – He rested after He had done His work. 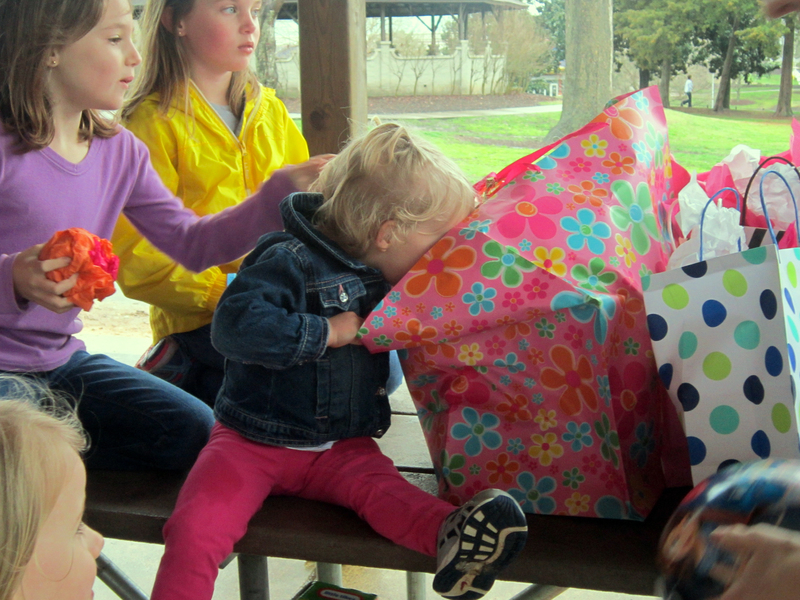 While having a darling birthday party feels important at the time, the time and money we invest in these events does little more than to take our eyes off what’s really important: our faith, our family, our friends and serving others. The next time you are surrounded by anything by easy of your own creating, remember your creator, the greatest Super Hero of all time – the One who willing and knowingly gave His life to give you freedom and eternal salvation. But you, O lord , are a shield around me; you are my glory, the one who holds my head high. 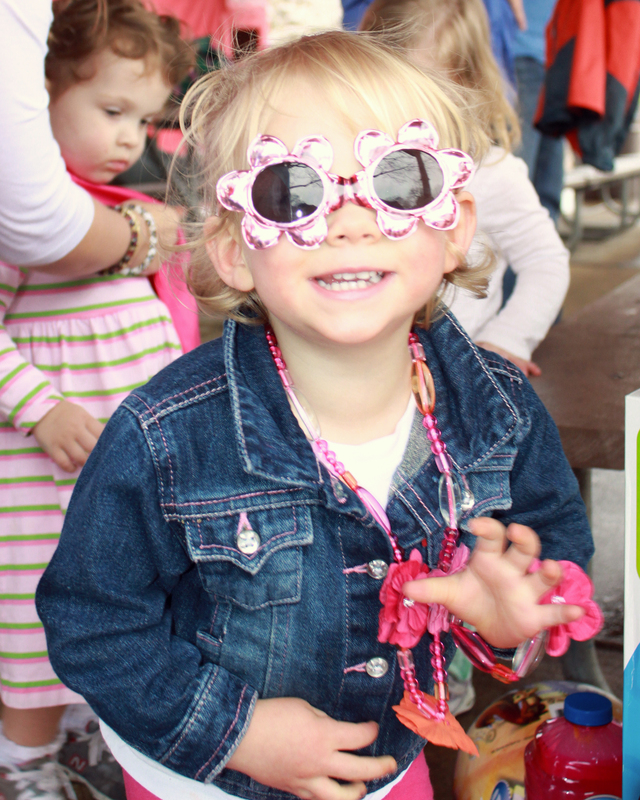 Little Miss A, Happy birthday to the sweetest little 2 year old on the planet. You are fierce, loving, loyal, adoring of you sister. You are coordinated and athletic. You are smart and sassy. We love you so much and know are lives are so much richer with you in them.